ZachNews has the latest information regarding the West Broadway, Needles Highway, and North K Street Closures, as part of the Interstate 40 / Arizona Highway 95 Connector construction project, in Needles, California. All paving work at intersections along West Broadway, Needles Highway, and North K Street in Needles, California have been completed as the Memorial Day Weekend 2017 begins. New paint along West Broadway, Needles Highway, and North K Street have been laid and sensors for the new traffic signal lights have been installed at the intersections of Needles Highway at West Broadway and Needles Highway at North K Street in Needles, California as well as at the intersection of West Broadway at J Street in Downtown Needles, California. The new traffic signal lights have not been activated yet and motorists are being told to still treat those intersections as 4 way stops until then. All lanes of West Broadway, Needles Highway, and North K Street are open. Road work continues on North K Street near Needles Bridge on paving the roadway. Heavy traffic along the detour routes of Race Street and L Street. The intersection of North K Street and Needles Highway is also closed for paving work. The goal is to have all of the paving work done before the start of the Memorial Day Weekend 2017. With a majority of the paving work completed, all lanes of West Broadway, Needles Highway, and North K Street reopened to traffic at 4:22pm PT on Friday, May 19th, 2017. For the last few days, construction crews have been laying out new asphalt along North K Street from River Road to Needles Highway, West Broadway from Walnut Street to Needles Highway and Needles Highway from O Street to North K Street as traffic use residential streets as a detour to get around the closure. North K Street, West Broadway and Needles Highway have new asphalt, and portions of North K Street, West Broadway and Needles Highway have new curves, sidewalk and wheelchair ramps, including at major intersections where new traffic signals where installed. The new traffic signal lights have been installed at the intersections of Needles Highway at West Broadway and Needles Highway at North K Street as well as at the intersection of West Broadway at J Street in Downtown Needles, California. Starting on Monday, May 22nd, 2017, construction crews will begin doing some paving work to near the Needles Bridge as well as some work intersections along West Broadway, Needles Highway, and North K Street, which may cause traffic, but shouldn’t take too long to complete each of the intersections. The construction work along West Broadway, Needles Highway, and North K Street for the last few months is all part of the Interstate 40 / Arizona Highway 95 Connector project to improve this heavily traveled business corridor connecting Arizona and California with new curbs, gutters, and sidewalks, and will be replacing paving and striping, utility relocation, drainage devices, retaining walls, and 3 actual traffic signals (Green, Yellow, and Red Lights). With most of the paving work completed, West Broadway, Needles Highway, and North K Street are slowly reopening up to traffic. For the last few days, construction crews have been laying out new asphalt along West Broadway, Needles Highway, and North K Street as traffic use residential streets to get around the closure. As of 2:33pm PT on Friday, May 19th, 2017, southbound North K Street from River Road to Needles Highway and all lanes of West Broadway from Walnut Street to Needles Highway and Needles Highway from O Street to North K Street have been reopened to traffic. Northbound North K Street from Needles Highway to River Road will soon be open. Traffic is a little slow in the area for the remaining work still going on along the roadway. New traffic signal lights have been installed at the intersection of Needles Highway at West Broadway and Needles Highway at North K Street, but are not activated yet so please treat those intersections as 4 way stops until then. Traffic control continues on the Needles Bridge as new asphalt is being laid out along Needles Highway. Construction crews are laying out new asphalt along Needles Highway well traffic on the Needles Bridge continues for construction work at the intersection of North K Street and River Road in Needles, California. Closure Area; West Broadway, Needles Highway, and North K Street is closed in both directions. Detour route to get to Needles Highway on the west and North K Street to the north using O Street to Market Street to either L Street or M Street to Race Street. Detour route to get to Needles Highway on the west and West Broadway to the south using O Street to Market Street to Market Street to either L Street or M Street to Walnut Street. Detour route to get to West Broadway from the south and North K Street to the north using Walnut Street to Market Street to either L Street or M Street to Market Street to Needles Highway to River Road to North K Street. Detour route to get to Jack Smith Memorial Park from North K Street to the north using River Road east and following the roadway eastbound towards Jack Smith Memorial Park. North K Street Underpass is not to be use by semi trucks and tall campers. use Blue Line or Purple Line detour routes to get around railroad tracks. Traffic control on Needles Bridge as new asphalt is being laid out along Needles Highway. The hope is to reopen Needles Highway to traffic in the next few days so to relieve traffic on residential streets. Until then, all detours remain in affect. Paving of Needles Highway continues today from North K Street to O Street. Roadway remains closed along West Broadway, Needles Highway, and North K Street, and detours remain in affect. 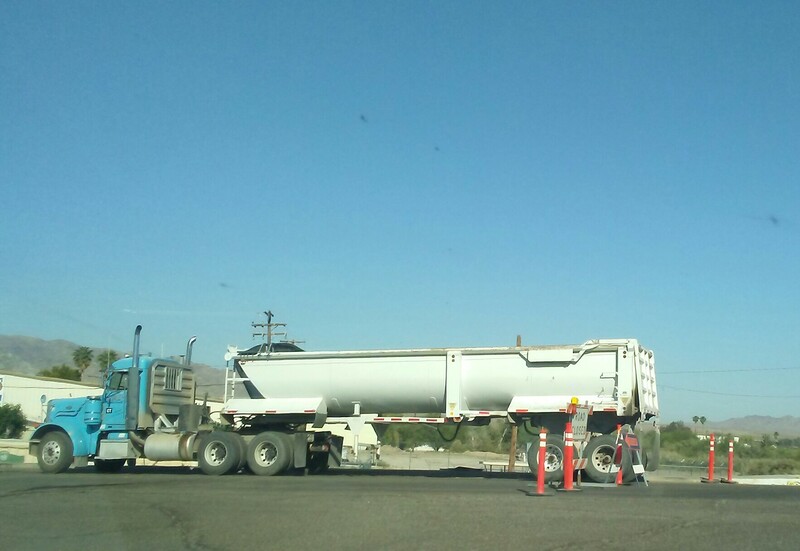 ZachNews received these pictures from Timothy Terral from Needles, California of construction crews laying new asphalt along Needles Highway and North K Street in Needles, California on Wednesday, May 17th, 2017 as part of the Interstate 40 / Arizona Highway 95 Connector Project. More paving work will continue on Thursday, May 18th, 2017 so to reopen the roadways to motorists using residential streets as detours around the closures of West Broadway, Needles Highway, and North K Street. Paving work will be finishing up along Needles Highway near West Broadway so to open traffic up later. Until the roadway is ready for motorist to drive on, West Broadway from Walnut Street to Needles Highway; Needles Highway from O Street to North K Street; and North K Street from Needles Highway to River Road remain closed. Construction crews continue to work along West Broadway from Walnut Street to Needles Highway; Needles Highway from O Street to North K Street; and North K Street from Needles Highway to River Road. New asphalt is being placed along the roadway, new sideways have been placed, new curves including at the intersection of West Broadway and Needles Highway has been built, and new traffic light signals at the intersections of West Broadway at Needles Highway and Needles Highway at North K Street have been installed with new street signs and street lighting. Paving work will be happening soon near the Needles Bridge on North K Street leading to traffic control as traffic going north and south will be sharing a single lane of traffic to get by. Lots to slow traffic in the area getting by the construction area, including along the Needles Bridge crossing from Mohave Valley, Arizona into Needles, California. All motorists should be prepare for heavy traffic around the construction zone and obey all traffic laws as well as use caution driving through the residential and construction zone. Businesses remain open at the intersections of West Broadway at Needles Highway and at Needles Highway at North K Street. Construction crews are paving West Broadway, from Walnut Street to Needles Highway. Road work continues along Needles Highway from O Street to North K Street and along North K Street from Needles Highway to River Road. Businesses remain open at the intersections of West Broadway at Needles Highway and at Needles Highway at North K Street. Lots to slow traffic in the area getting by the construction area. In the next few days, paving work will be done near the Needles Bridge on North K Street leading to traffic control as traffic going north and south will be sharing a single lane of traffic to get by. Prepare for heavy traffic like what occurred late last week. 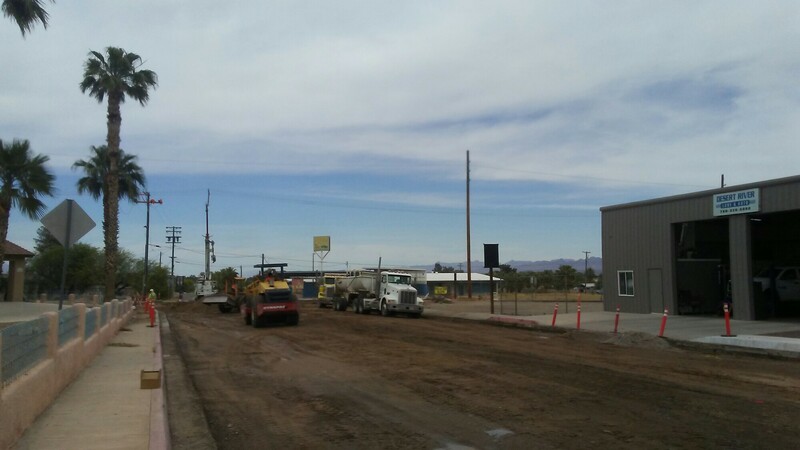 Construction crews are working on the roadway along North K Street near the Needles Bridge in Needles, California. Traffic control is in effect for both southbound and northbound traffic crossing the Needles Bridge. Traffic in both directions are being stopped and taking turns getting by the construction area. Please be prepare for heavy traffic in the Needles Bridge. Also, North K Street is close up to River Road and both L Street and M Street are closed at Needles Highway. Traffic is being detoured from North K Street at the Needles Bridge onto River Road, onto Needles Highway, onto North K Street, onto Market Street, and onto either M Street to Walnut Street to get to West Broadway or Market Street to O Street to get to West Broadway. Please use caution well entering the residential area near the Needles Jam 2. Closure and road work is all part of the Interstate 40 / Arizona Highway 95 Connector construction project. Detour route to get to West Broadway from the south and North K Street to the north using Walnut Street to Market Street to either L Street or M Street to Race Street. 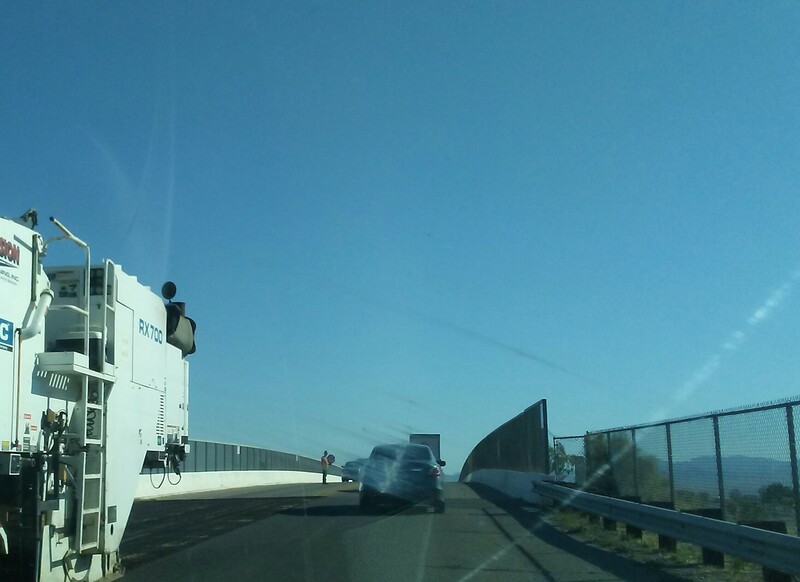 ZachNews has spotted southbound North K Street closed at Race Street in Needles, California as part of the Interstate 40 / Arizona Highway 95 Connector construction project. Motorists heading southbound are being detoured onto Race Street to L Street, and from L Street onto either Walnut Street to West Broadway or Market Street to O Street to Needles Highway. West Broadway from Needles Highway to Walnut Street and Needles Highway from L Street to O Street in Needles, California remains closed as part of the Interstate 40 / Arizona Highway 95 Connector construction project. Motorists wanting to use Needles Highway are using L Street, Market Street and O Street to get east to west on Needles Highway. Motorists wanting to use Needles Highway are using L Street, M Street and Walnut Street to get south and north on West Broadway and to go over the railroad tracks. Motorists in tall campers and semi trucks are being told not to use North K Street or the North K Street Underpass because of the 8ft. clearance height. Businesses are open in the closure zone, including Miranda’s Car Wash which can be accessible by using O Street to Race Street to N Street; On Site Oil and Lube which can be accessible by using Market Street; and Valenzuela’s Cafe off Chestnut Street near M Street. Construction crews have closed West Broadway from Needles Highway to Walnut Street and Needles Highway from L Street to O Street in Needles, California as part of the Interstate 40 / Arizona Highway 95 Connector construction project. West Broadway from Walnut Street to Needles Highway is closed. Needles Highway from L Street to O Street is closed. Closures as part of the Interstate 40 Arizona Highway 95 Connector construction project. Closures may last from a few days to a few weeks. West Broadway (From Walnut Street): Take Walnut Street East to L Street north back to Needles Highway (At L Street). Needles Highway (From L Street): Take L Street south to Market Street west to O Street north back onto Needles Highway (At O Street). If you’re driving tall semi trucks or campers, do not use the North K Street Underpass or North K Street from Walnut Street to Front Street. The North K Street Underpass has a Clearance Height 8ft and not recommended for tall semi trucks or campers. Use West Broadway or Interstate 40 as your best detour. Businesses in the closure area are still open, including Miranda’s Car Wash which can be accessible by using O Street to Race Street to N Street; On Site Oil and Lube which can be accessible by using Market Street; and Valenzuela’s Cafe off Chestnut Street near M Street. Please make sure to stop in and support our local businesses during Needles Jam 2. The Interstate 40 / Arizona Highway 95 Connector project will include new curbs, gutters, and sidewalks, and will be replacing paving and striping, utility relocation, drainage devices, retaining walls, and 3 actual traffic signals (Green, Yellow, and Red Lights) which will be located at the intersections of J Street and West Broadway, West Broadway and Needles Highway, and Needles Highway and North K Street. The Interstate 40 / Arizona Highway 95 Connector project will also include the widening of the road to ease turns at intersections for RVs and semi-trucks and to alleviate congestion in the traffic hours. The project was awarded to Hal Hays Construction out of Riverside, California in the amount of $3,312,577.00 and Construction Management will be completed by W.S.P. Parsons Brinckerhoff also out of Riverside, California. Previous Needles, CA: Stop into Valenzuela’s Cafe if you’re stuck in Needles Jam 2 traffic hungry. Next Needles, CA: Getting classy vehicles cleaned and detailed during Needles Jam 2 at Miranda’s Car Wash.